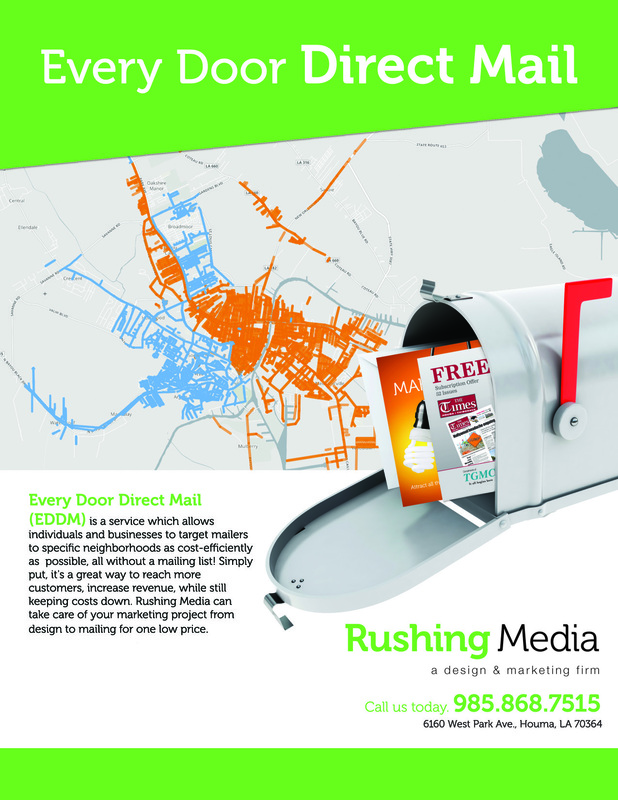 EDDM stands for “Every Door Direct Mail.” Designed to help businesses deploy promotions and advertisements to a targeted area, this U.S. Postal Service program allows the customer to have their mailer hand delivered to every mailbox along chosen routes. EDDM is a cost effective alternative to traditional direct mail that allows you to saturate the market and promote to every household or business in a desired geography. We offer full service EDDM, from custom designing your mail piece, to selecting the area you wish to reach based on area, routes or household median income. Contact us to begin your project today! With a history of producing go-to publications for over 30 years, Rushing Media is one of Southeast Louisiana's top publishing houses. We proudly produce the area's top publications, The Times of Houma-Thibodaux, Point of Vue Magazine, and Bayou Business Monthly. We also produce a variety of niche products throughout the year, focusing on home improvement, restaurants, major retail and more. Copyright ©2019 Rushing Media. All Rights Reserved.